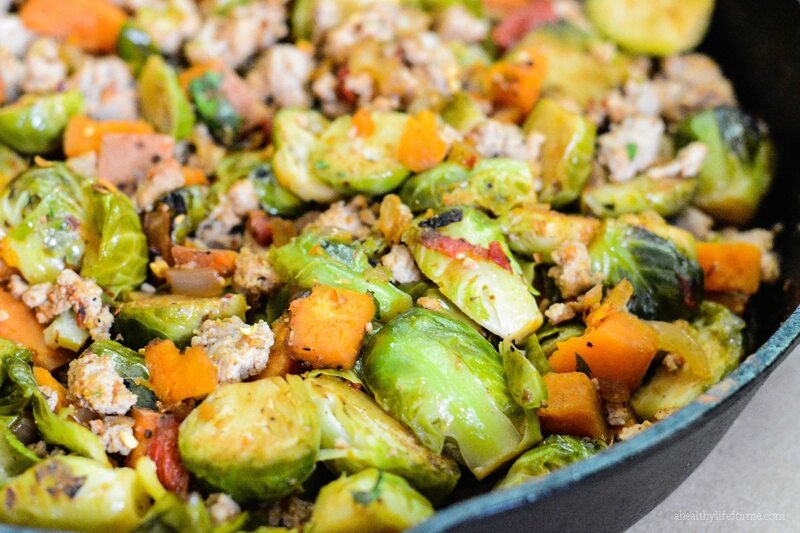 Brussels Sprout Sweet Potato Hash is not only uber healthy but packed full of spicy flavor. You can enjoy this recipe for breakfast or a great hardy dinner. A friend posted a picture of a brussels sprout dish with bacon and sweet balsamic vinegar glaze on instagram and I got hungry, then I got to thinking about how I could make something similar without the bacon (sorry bacon lovers) a protein that was leaner and with a bit of a spicy kick. I have really been a really good girl lately eating a diet loaded with fresh clean veggies and lean protein. I have been feeling better for it, loads more energy and getting a great night sleep. One of the keys to being successful at eating all those fresh veggies and lean proteins is, of course, grocery shopping in the produce section, not the freezer or can good section, but also having recipes that are easy, delicious and simple to pull together. This dish is a one pot wonder, no other baking dishes required (I love an easy clean up), is Paleo (Sriracha sauce is fine in small amounts) and Gluten Free. I made enough so I would have leftovers and had it for my lunch the next day. Yep, it reheated just fine. Note: You could substitute Bison/Buffalo in place of the turkey to keep this dish lean. In a large cast iron or heavy skillet add turkey and cook over medium heat, until cooked through. Add oregano and red pepper flakes and stir to combine. Remove turkey to a bowl. Add onion and garlic to pan and cook 2-3 minutes stirring. 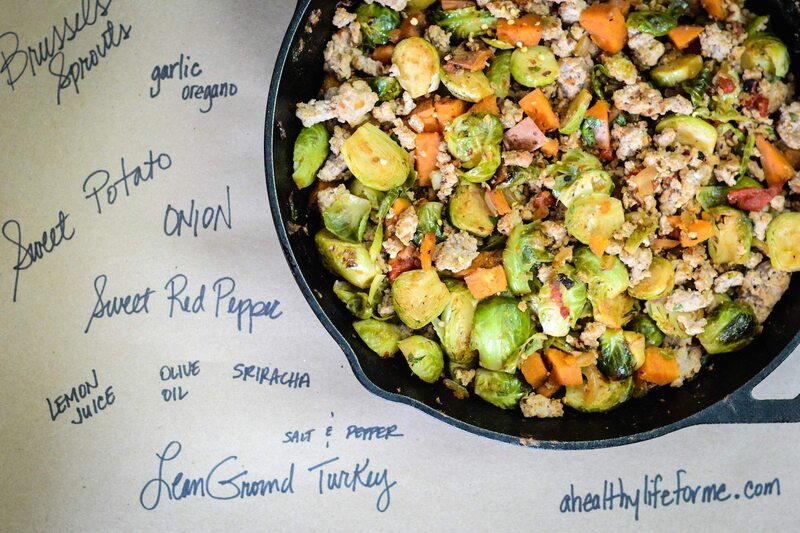 Add Brussels Sprouts, Sweet Potato, Red Pepper and water to pan. Cover with lid and cook 5-7 minutes, until potato and sprouts can be easily pierced with fork, but sprouts are still bright green. Meanwhile add dressing ingredients to a bowl and whisk to combine. Add meat back to vegetables in pan and top with dressing. Stir to combine and serve. Yes please! 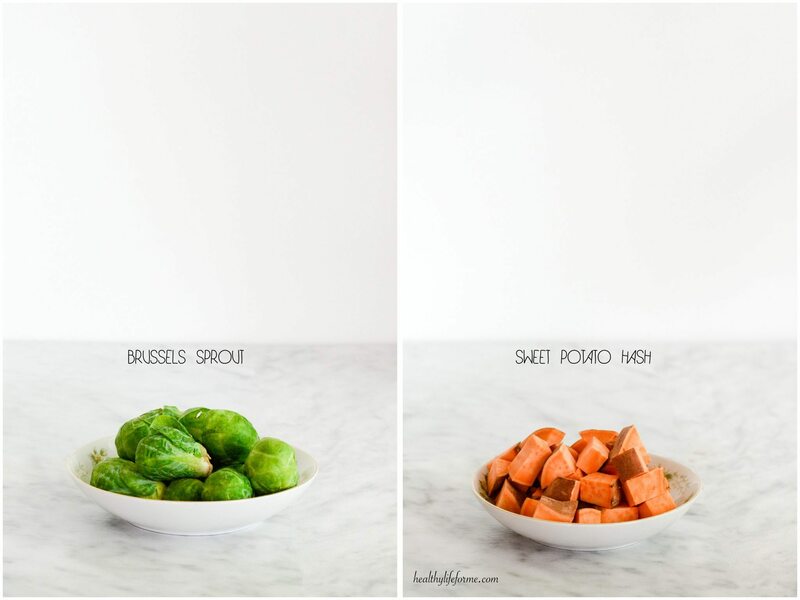 I adore all kinds of hash, and with sweet potatoes and brussels? This looks like the perfect breakfast or dinner! Pinned! 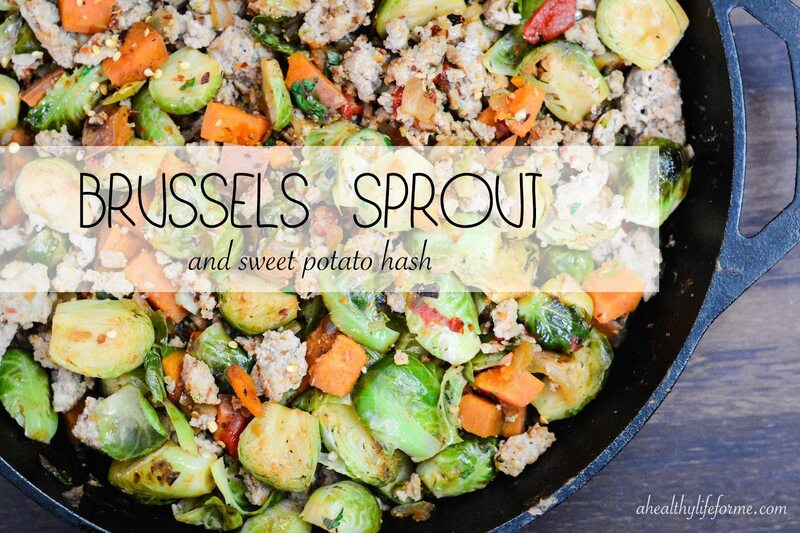 I have never been a huge lover of Brussels sprouts but this recipe look delicious. I love sweet potatoes so I am going to have to make this. That is wonderful Asleigh, thank you so much for letting me know. Yes, the spicy factor can be a bit too much for some. Easy to adjust. This recipe is so yummy but my husband and I are not big on spicy food. We tried the sauce last time and he wasn’t fond of it. Is there another type of sauce that you think may work for is instead? Katie, I am glad you like the recipe, but it is a pretty spicy dish. You can just skip the the sriracha sauce all together and if you do not have enough liquid add a bit more lemon juice/olive oil. You can also substitute 2-3 tablespoons of Franks Hot Sauce, which has a differetnt kind of heat than sriracha. I hope this helps. Let me know if you enjoy it. I love this recipe. 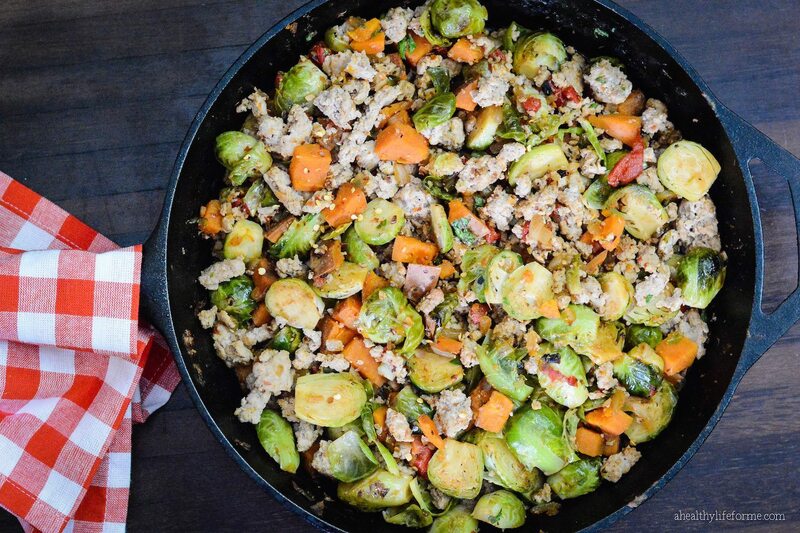 I found it because i wanted to do something with ground turkey, brussel sprouts, and sweet potato. Perfect. My husband and I like spicy food so the amount of sriracha was fine, but it’s easy to adapt for different tastes. Thank you. I am so happy you liked the recipe Beth, definitely has a bit of kick. Hi! I love this recipe, I am about to make it for a second time. Do you happen to have the nutritional facts on this dish? Calories per serving? Hi Katie, I added the nutritional information to the post. Thanks for following and letting me know you liked the recipe! Enjoy! thank you, this is absolutely delicious, exactly what i was looking for.